Leading is a creative act, no matter how structured the task appears to be. Collaboration changes the way we see the world. A guide to collaborative impact for leaders in industry, government and social change networks. Our world is facing unsustainable global trends—from climate change and water scarcity to energy insecurity, unfair labor practices, and growing inequality. Tackling these crises effectively requires a collective form of leadership. But, in a world of many silos, how do we get people to work together toward a common goal? It is a question that Dr. Petra Kuenkel answers in The Art of Leading Collectively. 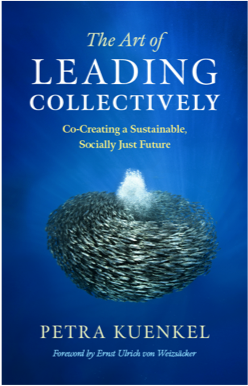 Readers learn how to tackle system change for sustainable development, reimagine leadership as a collaborative endeavor, retrain leaders to work collectively, and manage diverse groups through a change process that has sustainability as a guiding focus. The book offers many examples of collective leadership efforts involving corporate, public, and nonprofit sectors around the world. Drawing upon two decades of pioneering internationally recognized work orchestrating multi-stakeholder initiatives, Kuenkel provides a roadmap for leaders from multinational companies involved in partnerships, international organizations engaged in cooperative development, public agencies, and interest groups—as well as for citizens seeking solutions to social and sustainability challenges. Sustainability and an economy for well-being is on the agenda of every nation, every organization, and many citizens today; it is a global movement that cannot be ignored. Become part of the community of game-changers. Leading collectively is a paradigm shift in how individuals find their leadership roles in a spirit of collaborative co-creation and contribution to the common good. The Art of Leading Collectively helps you navigate the collaborative journey. It will take you backstage, behind the scenes of what the world will need more of if we want to co-create a better future: successful collaboration. It will help you implement more outcome-oriented and constructive co-creation on a day-to-day basis – for yourself, your team, your organization, and your cross-sector collaboration initiative. 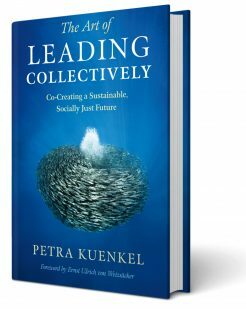 The new book by Dr. Petra Kuenkel with foreword by Ernst Ulrich von Weizsaecker, is a guide to collaborative impact for leaders in industry, government, and social change networks. The enablers of Collective Leadership can be made transparent. They can be learned and enhanced – individually and collectively. Are you starting a complex cooperation project, or are you in the midst of one you want to improve? Do you need to shift the mind-set of stakeholders toward collaboration, or to find new ways to overcome challenges? Do you need to arrive at tangible outcomes in a short time frame? This course will help you to implement more outcome-oriented and constructive co-creation on a day-to-day basis for yourself, your team, your organisation, and your change initiative with diverse stakeholders. It equips dedicated change makers in the public and private sector, as well as civil society organisations, with a tool for better co-creation. The dimensions of collective leadership can be learned and enhanced – individually and collectively. The tool presented in The Art of Leading Collectively – the Collective Leadership Compass – helps you to keep your collaboration journey on track and to find the necessary course corrections. The Collective Leadership Compass was developed by the Collective Leadership Institute’s Executive Director Dr. Petra Kuenkel. Combining over 20 years of practice in complex multi-stakeholder settings around systems change for sustainability with scientific exploration, Dr. Petra Kuenkel identified the various dimensions and aspects that comprise the Compass.It can be used both as a diagnostic tool and a process methodology. It focuses on invigorating human interaction systems as core drivers of transition processes to assess, plan, and enact the collaborative change required for sustainability. It helps navigate complex challenges by introducing a meta-level guiding structure, which becomes a fractal of the competence and collaboration pattern that needs to emerge for the transition envisaged. 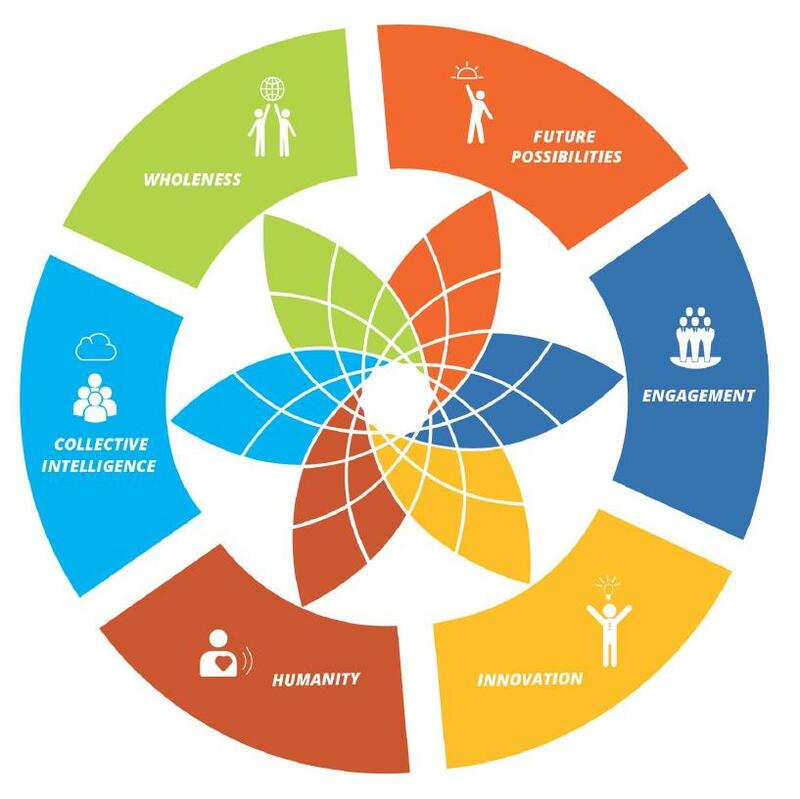 The Collective Leadership Compass is a tool for supporting individuals, teams, and organizations to strengthen leadership dimensions and build vibrant and robust “collaboration ecosystems” in change processes. The Compass is designed to assist process competence throughout any initiative. It has the potential to enliven collaboration processes and help identify collaboration challenges. It helps individuals rediscover and invigorate their human competencies for collective leadership. It reveals patterns of skills and helps teams enliven collaboration by recognizing when specific capabilities are called for, require building, or are out of balance. It recognizes that every context is unique and different ‘Aspects’ may come into focus at different moments in every process. Dr. Petra Kuenkel is a leading systems thinker, author, and psychologist. As a Member of the Club of Rome and the Founder and Executive Director of the Collective Leadership Institute, she promotes the scaling-up of collective leadership and collaboration skills for change agents in sustainability transformation from the private sector, public sector and civil society. She has a profound background in change leadership in complex systems and gained extensive experience in consulting complex multi-stakeholder partnering processes internationally, in particular multi-actor collaboration processes around common goods or economic development. She is an expert for complex cross-sector and cross-institutional partnering, multi-stakeholder dialogues and standard development for value chains. She is re-inventing and cultivating competencies in dialog and collaboration as well as leadership skills to move sustainability issues forward as a collective. The new paradigm we must establish is about creating systems that bring out the best in us! Book Dr. Petra Kuenkel as a passionate Keynote Speaker for your Event and get inspired by her mind changing and empowering speech. Request available times from Alina Gruen (German Office): alina.gruen[at]collectiveleadership.com. The Collective Leadership Compass is a practice-oriented approach to leading complex change in multi-actor settings. Events that change the world - be part of the movement! Join us at conferences and events around the world. How to shift the way organizations and societies co-create?